The Ship Inn01263 722671 work Restaurant - PubSet overlooking the North Sea on the Norfolk coast, The Ship Inn is 300+ years old and has become one of the finest destination pubs on the Norfolk coast, offering a warm welcome with unrivalled views of the golden sands of north Norfolk and the ocean. 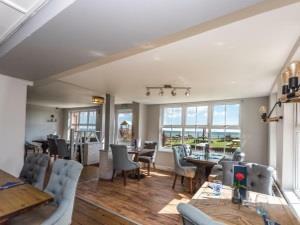 Our beautiful coastal restaurant has been charmingly restored to embody it’s seaside roots, offering relaxed and casual dining with stunning hip coastal vibe. We offer three newly renovated boutique en-suite rooms. Head Chef, Blake Payne prides himself in using only the best, most consistent independent local farmers, fishermen, producers and suppliers throughout Norfolk. We offer a seasonal menu for diners to enjoy fresh, locally sourced delicious seaside cuisine and an extensive gin selection, along with an ever growing wine collection, local beers and ales. Guests can dine outdoors in the warmer months and enjoy the rugged coastline and breathtaking sea views. Set overlooking the North Sea on the Norfolk coast, The Ship Inn is 300+ years old and has become one of the finest destination pubs on the Norfolk coast, offering a warm welcome with unrivalled views of the golden sands of north Norfolk and the ocean. The picturesque village of Mundesley is situated on the north Norfolk coast. Its beautiful beach is one the cleanest in Britain with plentiful sands stretching for miles. Mundesley beach has been voted the 2016 Best Blue Flag Beach in Britain.